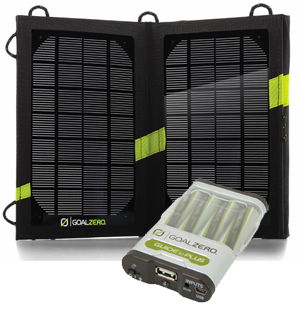 With the Guide 10 Plus Recharger and Nomad 7 Solar Panel you have a portable and rugged charging kit. Charge AA or AAA batteries from the sunlight or any USB port, then power your satellite phone, smartphone, MP3, GPS, or perk up your tablet in a pinch. Charge & store. Use the sunlight or USB power to charge the power pack, use it later when needed. Can be used with Iridium, Thuraya and Inmarsat satellite phones and terminals (satellite vehicle charging adapter is required for use).